Being between Scylla and Charybdis was the ancient Greek equivalent of being between a rock and a hard place. Except with more teeth. Back in the days of ancient Greece, if a person was faced with two equally disastrous or perilous choices, it was referred to as being “between Scylla and Charybdis,” something akin to being between the devil and the deep blue sea or between a rock and a hard place. It wasn’t merely an expression. In days gone by, many a brave sailor lost his life either by drowning in the violent whirlpools created by the currents or by being smashed against the rocks at land’s edge in the narrow Strait of Messina separating the western tip of Sicily and the eastern edge of Italy. In Greek mythology, these twin hazards were the fearsome sea monsters Scylla and Charybdis. It was Scylla who gobbled up passing seafarers and tossed any grizzly remains on the rocks below, while Charybdis made sure that the swirling waters swallowed up any vessel sailing through the treacherous passage. Let’s find out exactly who these monsters were and why they were so vicious and unmerciful. Scylla was once a beautiful nymph who was turned into a repugnant monster by either Amphitrite, the wife of the sea god Poseidon, or (more popularly) by the sorceress Circe. Whichever of these two cast the spell—or as the story goes, poisoned the water where Scylla swam—it was all due to jealousy. Don’t mess with my man, Circe thought as she ensured her rival was out of the picture. Scylla was transformed from a lovely young nymph into a hideous monster with twelve tendril-type legs and barking canine heads around her waist. The most frightening thing about her were the six long serpentine necks topped with ugly heads each equipped with razor-sharp teeth. Those heads could dart out from behind the rocks at any time, grab an unwary mariner or two in their vice-like jaws and make mincemeat of them. Charybdis—who lived opposite Scylla—was said to be the daughter of Poseidon and Gaia, and inherited from her powerful parents the ability to reclaim the land and return it to the sea, which she set about doing with zeal. But this infuriated Zeus who wanted the land for himself, so he chained her to the sea floor and cursed her with an unquenchable thirst for salt water. Thus imprisoned, Charybdis spent her days slurping down vast quantities of water then disgorging it, creating massive whirlpools capable of sinking the sturdiest ships and besting even the most capable sailors. Nothing could get through the vortexes she generated. It’s no wonder these girls were bitter. Their punishments far exceeded their crimes. As usual. So why not make the most of what life dished out to them? They didn’t work together as such, but theirs was the perfect partnership for devastation. The stories about the pair come from a number of sources in classical literature. In the Odyssey, Homer, writing in the eighth century BCE, recorded that in order to avoid being trapped in one of Charybdis’s deadly whirlpools and risk losing his ship, Odysseus was instructed to sail closer to Scylla’s side of the channel. 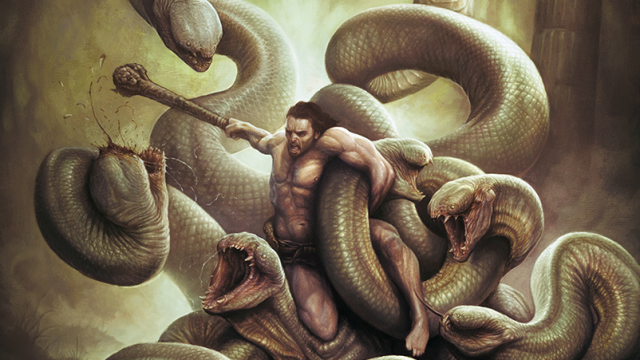 It meant that he lost six of his crewmen, as Scylla darted down to grab a snack for each of her six heads. That’s some serious collateral damage. Another time, winds forced Odysseus back into the Strait of Messina where he found himself being sucked down deep into the eddying waters. As his craft was tossed upwards, he quickly grabbed onto a tree branch, clinging for dear life until hours later, timbers from his broken boat resurfaced. Odysseus jumped from the tree onto the raft and set off as fast as he could to get the devil out of there. The old Greek stories of these female monsters do of course contain some truth about that stretch of water. The strong tidal currents, swirling eddies, and the sharp rocks in the Strait of Messina continue to pose some navigation hazards for sailors. Scylla and Charybdis remain formidable monsters even if we no longer refer to them as such.